Introducing Your Cat To A Dog? I’ve been dating a great guy for the past six months. He’s got a Visla. I’ve got a terrier mix and a cat. We’re thinking about moving in together. How do we make this transition work for our pets? You’ve been staying out late and coming home with the scent of a Visla on you. You’re having warm thoughts of some guy and his dog. Your pets are so onto you. Pet relationships are like puzzle pieces. You need to try out a few things to see how your pets are going to fit together. The most important thing to consider is pack order. Dogs have varying levels of dominance . If you have two dogs that are both highly dominant, hire a behaviorist to help you integrate your pack. Most of the time, this isn’t a problem. 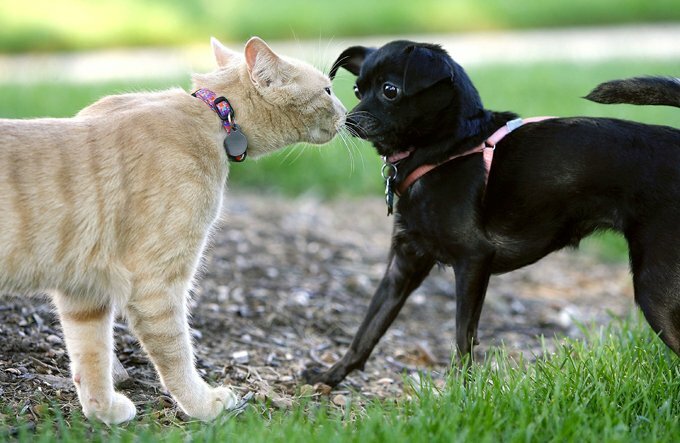 So, start by imagining your pets getting along. Think about this positively. Do not imagine your pets attacking one another. Imagine them hanging out together as friends. Then, tell your pets about the new change. Pets often fear that someone is going to be left behind. Make sure they know that they are all moving together to the new home. Talk about the new change often. Decide whose home you’re moving into. Put a t-shirt on the new pet’s bed and then, a few days later, move it into the new space. This helps the current animals get used to the new scent in their home. Your cat may pee on the t-shirt, or try to cover it up. Your dog may roll on it. Don’t read too much into this. Introduce the dogs on neutral ground. Have several visits together at a dog park . Don’t feel nervous. Remember to feel and think positive! If it’s possible, don’t move your cat . It’s a lot easier for cats to put up with animals in their space than to have to deal with the change of moving to a new space with animals already in it. If it’s not possible, it’s important for the cat to start in a room of its own. When you move in together, put the kitty box and the cat food in your cat’s “room.” Put your cat in the room. The cat is going to live here, exclusively, for a week. Visit your cat often. Your cat needs to feel your love. As your cat adjusts, let the other pets into his or her room. Then, when it’s time to introduce your cat to the rest of the house, take the Visla out of the home for a few hours so the cat can walk around and smell in peace. Also, it’s important to keep your indoor/outdoor cat inside for a few weeks. Sometimes pets get out and try to “go home.” They don’t realize that they are miles away, and they can get lost. Slowly introduce the pets to one another in the home. Use gentle praise and don’t be stressed out and nervous. There’s nothing to worry about here. Finally, try to keep your routines the same. Feed your pets at the same time in the same way. Come home and greet in the same way. Go slow and expect a few bumps. Give everyone lots of love and attention. It usually takes a good month for things to start feeling normal again. If your pets are still having trouble, hire an intuitive animal communicator and/or a behaviorist to help smooth out the bumps.